Below in our Ireland car shipping resource, you'll find out which options are available to you, estimated time to it takes to ship a car to Ireland from the US, port information and more. You'll have two options: either use your own container or you can take advantage of our shared container service. We specialize in the latter and it offers much lower costs. This questions depends on which port your vehicle leaves from as well as how quickly it's delivered. Once it's on the water, to ship a car from New Jersey to Ireland it takes roughly 2-3 weeks. We ship to other destinations in Ireland but these cities more so than the others. Rates and shipping durations for vehicles vary depending on the final point of drop off but we will work with you to find the best option. In order to do this, the owner must have lived outside the EU for at least the previous twelve months, have bought the car outside the EU, driven it for at least six months prior to moving to Ireland, and already paid the 'sales tax' or equivalent in another country. Should you be staying for more than a year, you'll have to register the vehicle regardless of temporary status. Registration is done at one of the national car testing service centers. 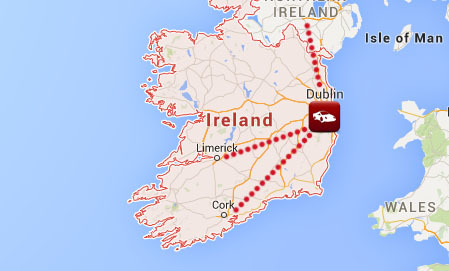 Shipping your car to Ireland doesn't have to be a frustrating proces. If you have any additional questions or would like a free estimate, call one of our specialists at (800) 599-0190 or fill out our free online quote form!